For nearly 2 decades, home and business owners who desire a creative, modern update to their properties have chosen Refresh…Design. 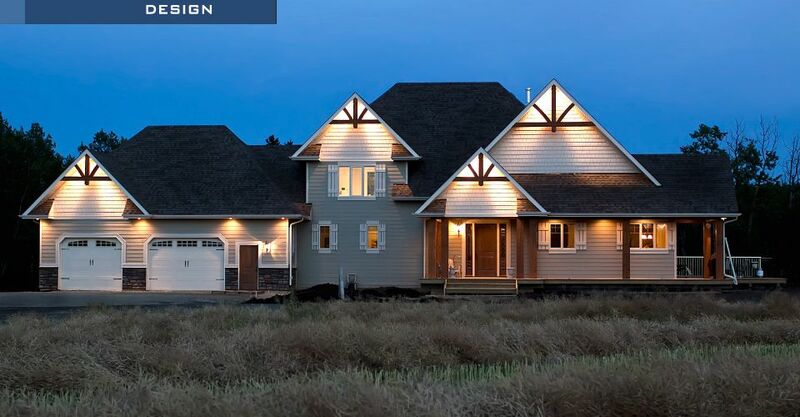 Over the years, the company has established a positive reputation for unique, affordable designs that can completely rejuvenate an entire property in Red Deer and beyond. Read the testimonials below to see what a few of our previous clients have to say about working with Refresh…Design and Kelly Devereaux to transform their living and work spaces. Speak to Refresh…Design today to learn how we can update your home or office! Studon Electric & Controls Inc. has grown substantially since 1995 and with that growth came the pains of expansion to our office in Red Deer. Our current office was built in 2003 and has gone through numerous expansions and renovations in the last 9 years. Recently we hired Kelly Devereaux from Refresh…Design to design and facilitate our latest renovation and I wish we would have hired Kelly a long time ago. Her keen eye to detail and incredible ability to visualize the outcome are amazing. Kelly has transformed our lobby, boardrooms, lunchroom and my office into very warm and comfortable environments. We take pride in our company and Kelly’s work resonates that pride and I would recommend her to anyone. Thank you, Kelly, for making our building not just a place to work, but a space we enjoy going to. CEO Studon Electric & Controls Inc. Working with Kelly was a wonderful experience.She listened to my preferences, understood my vision and made it happen. She would guide me, teach or point out options as we went, but she was careful to ensure that she was creating what I wanted. Kelly’s experience in the industry was invaluable, she had ideas that were current and knew the products and their pros and cons well. My best specific example was the day we went to choose kitchen cupboards. In ten minutes, Kelly had narrowed a selection of hundreds of choices to just three that were viable color and style choices to achieve the look that I wanted. It would have taken me weeks to get to that point, weeks of stress and self-doubt. The final product looks spectacular. It’s true to me but with a flair and a feel that I would never have achieved on my own. This is actually the second home that Kelly has done for me and I highly recommend her! We were in the middle of our home renovation when we ran out of steam. Kelly looked at what we had started, made some suggestions and necessary selections for our kitchen and master makeover and they turned out beautiful, warm and relaxing. I have also referred Kelly to a client that was about to move and have baby number three. They were on a tight timeline to make changes and move in before the baby arrived. With assistance from Kelly, they were able to transform a nice home with good bones into a showstopper. Great job, Kelly! Thank you! We almost didn’t downsize into the 1983, everything pink duplex we were looking at purchasing until Kelly assured us that she could bring it back into the 21st century. She was able to see past the outdated countertops and brass hardware and transformed it into our very own show home. She has a great eye for detail, creative ideas and made the whole process enjoyable, all the while appreciating our budget. I wouldn’t think twice about hiring Kelly again. I have recently had the pleasure of employing Kelly Devereaux to design and decorate my home. Our first meeting was very professional and informative. Kelly spent time to get to know me as well as the feeling I wanted for my new space. She did all the legwork to find pieces that suited my new urban living lifestyle and my personality! The end result was amazing. She worked very hard and diligently to have everything in place when I walked in the door, from the pictures on the walls to hanging towels and creatively placing accessories throughout the home. Her professionalism and flair for decorating made my transition into my new home a pleasure! After five years of wanting to renovate, we hired a contractor to renovate our 50-year-old mountain view home. We were told that we would need to make some material selections for countertops, backsplash tiles and flooring. We went and had a look and the choices were overwhelming. So many samples, so many choices. We called our contractor and told him about our shopping experience and he suggested we hire Kelly from Refresh…Design. Kelly was very friendly and professional and I soon discovered that I was comfortable handing over all the details to her. My only requests were to have it look “finished” and that I liked mosaic tile. Within a few days, Kelly brought over samples of the different materials and ideas she had put together. Seeing it all laid out, it looked awesome, so we said let’s go with it. We went away for a week and upon our arrival home, we found a complete bathroom transformation. It was beautiful beyond words and included all the finishing touches. In the next few weeks, we had a kitchen facelift with sink, faucet, cabinet hardware, countertop and backsplash tile all selected by Kelly as well as new slate tile in the foyer to replace the tattered and worn out hardwood. Kelly also left us with a file folder of ideas and paint colors for our future wish list that we hope to complete next summer. 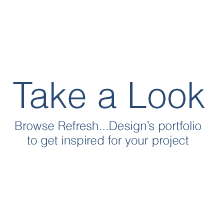 We would highly recommend Refresh…Design for all your renovation and design needs.